G.W. 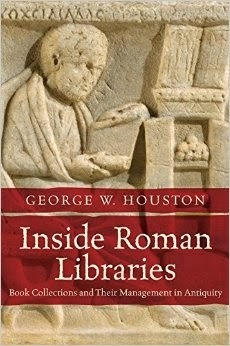 Houston, Inside Roman Libraries: Book Collections and Their Management in Antiquity (Chapel Hill: University of North Carolina Press, 2014) is an important resource. Libraries of the ancient world have long held a place in the public imagination. Even in antiquity, the library at Alexandria was nearly legendary. Until now there has been relatively little research to discover what was inside these libraries, how the collections came into being and evolved, and who selected and maintained the holdings. In this engaging and meticulously researched study, George Houston examines a dozen specific book collections of Roman date in the first comprehensive attempt to answer these questions. Through a careful analysis of the contents of the collections, Houston reveals the personalities and interests of their owners, shows how manuscripts were acquired, organized, and managed, and identifies the various purposes that libraries served. He takes up the life expectancy of manuscripts, the sizes of libraries, and dangers to books, as well as the physical objects within libraries from scribal equipment to works of art. The result is a clearer, more specific, and more detailed picture of ancient book collections and the elements of Roman libraries than has previously been possible. Reviews: Scott G. Bruce (BMCR); Larry Hurtado blog. Luther’s Notes Discovered - in a library! Poll: What’s the Goal of Textual Criticism?